The esProc table sequence is a two-dimensional structured table, having concepts of field, record, primary key and index. These concepts originate from the data table of relational database. A table sequence is also an explicit set of genericity and orderliness, on which you can perform structured data computing more flexibly. A record sequence is the reference of the records of the table sequence. The two are closely related and have basically the same uses. This part will explain the basic TSeq and RSeq operations from aspects of access, loop functions, aggregate functions and set operations. Note: A table sequence object can be created based on a database or a file, or by inserting records into an empty object. A record sequence originates from one or more table sequences but it doesn’t store physical records. It only stores the references of some records in the table sequence(s). As the second record in B1 is the reference of the twentieth record in A1, A2 and B2 have the same results. According to the expressions of A2and B2, both table sequence and record sequence have completely the same syntax for field accessing. 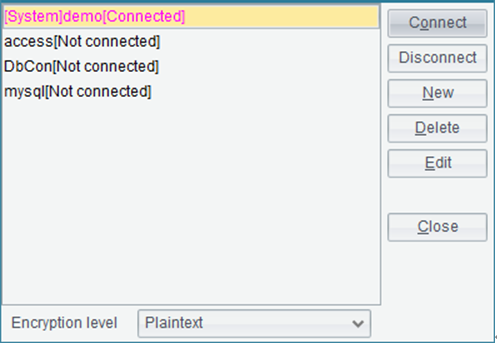 A field name can be replaced by the field’s sequence number and the result won’t change. As with this example, A2 can be written as =A1(20).#3. Because the replacement is employed universally in esProc, we won’t go into details about it in the following examples. 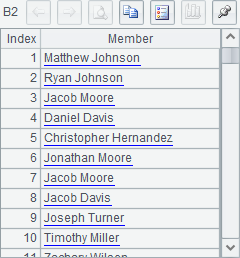 Using the syntax of T.(x), you can only retrieve one column of data as a sequence without the structured column name. With T.new() function, however, you can retrieve one or more columns of data as a table sequence with structured column names. Whether the object of computation is a table sequence or a sequence, both T.new() function and A.new() function will create a new table sequence. This means the result of B1.new(PName, Amount)is also a table sequence. With encapsulated complex loop statements, loop functions can perform the same computation on each record of a table sequence/record sequence. 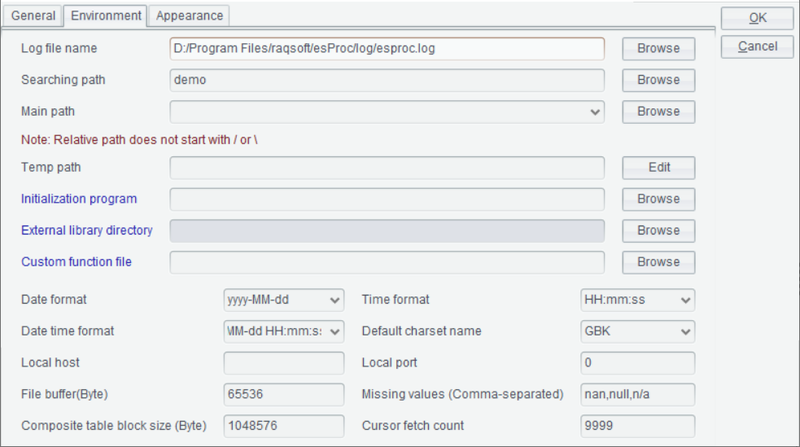 For instance, select is for data querying, sort for data soting, id for getting distinct records, and pselect for fetching sequence numbers of the records satisfiying the specified condition(s). Here the most basic ones - select function and sort function- will be illustrated. For more information about loop functions, please refer to Loop Computations. Whether the object of computation is a table sequence or a record sequence, the result of select function will always be a record sequence, that is, the references of records instead of the physical records. Whether the object of computation is a table sequence or a record sequence, the result of sort function will always be a record sequence. In fact, except for record modification, most of the functions can be used to handling table sequences and record sequences. Other aggregate functions include min(for finding the minimum value), sum(for calculating sum), avg(for calculating average), count(for counting), etc. 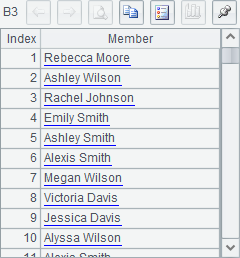 Note: groups function generates a new table sequence. The sign “~” in expression count(~) represents the current group. The expression can also be written as count(ID). Since the code doesn’t designate field names for the result, default field names like month(Date) are used. You can use a colon to specify a field name, as with =A1.groups(SalesID, month(Date):Month;sum(Amount),count(ID)). Set operations include intersection “^”, union “&”, difference “\” and concatenation “|”, etc. The records of the table sequences in A3 and B3 are the same as the records in A2 and B2 in the previous example. This means, as the sets of physical members, different table sequences have different members and the intersection of them will always be empty. Thus the operation has no practical significance in business. Only set operations performed on record sequences originating from the same TSeqs have business significance. It makes no sense in realworld businesses to perform intersection and difference between different TSeqs or RSeqs originating from different TSeqs. A3 calculates the union of A2 and B2 by combining members of the two sets in order and removing the duplicate members. B3 calculates concatenation of A2 and B2 by concatenating members of the two sets in order and retaining the duplicate members. Records of table sequences in A3 and B3 are the same as those in A2 and B2 in the previous example.